For our Misfit Of The Month feature this month, we're thrilled to turn the spotlight on The Dark Angel. Prepare to be transported into a magical world, where your wedding outfit fantasies could just become reality! 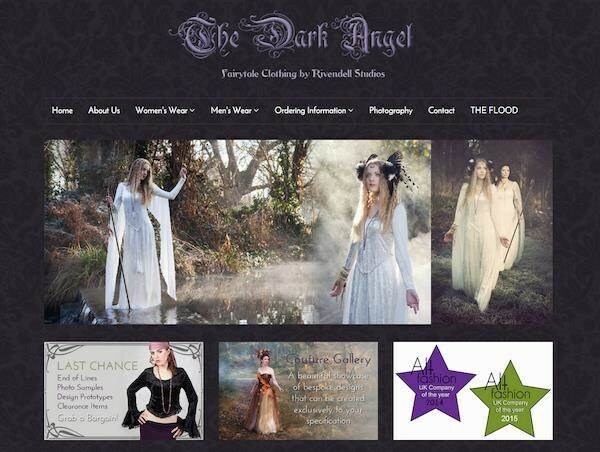 The Dark Angel Design Co is a UK based studio that designs and manufactures fantasy / fairytale clothing for women, men & children (and the occasional dog!). How long have you been doing this, where did it all begin? I have worked as a clothing / textile designer since the late 1980s. I was never really happy working for other studios though, as it was creatively very limiting. So I took a chance on establishing my own label and founded ‘The Dark Angel’ back in 1995. What sort of items can people order from The Dark Angel? We offer a wide range of gowns, coats, shirts, waistcoats jackets etc. Most of our designs are inspired by historical or fantasy costume. Our menswear in particular is often created using original patterns that have been adapted for modern body shapes and fabrics. 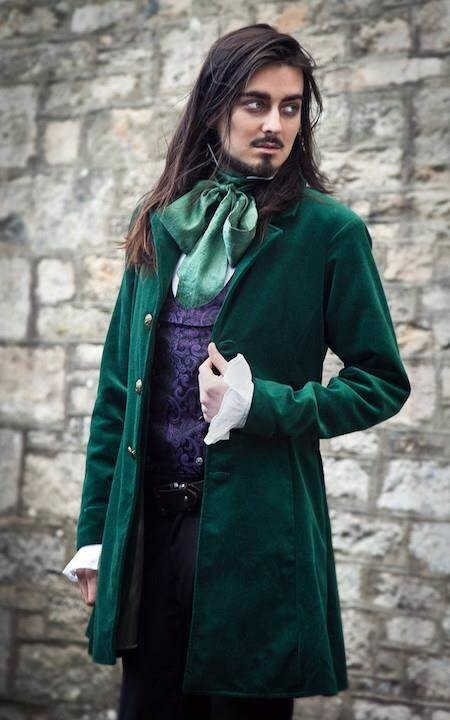 Victorian style Merton Coat in cotton velvet and lined in satin. Which designs are the most popular? Currently for men, the Bexley coat is very popular. 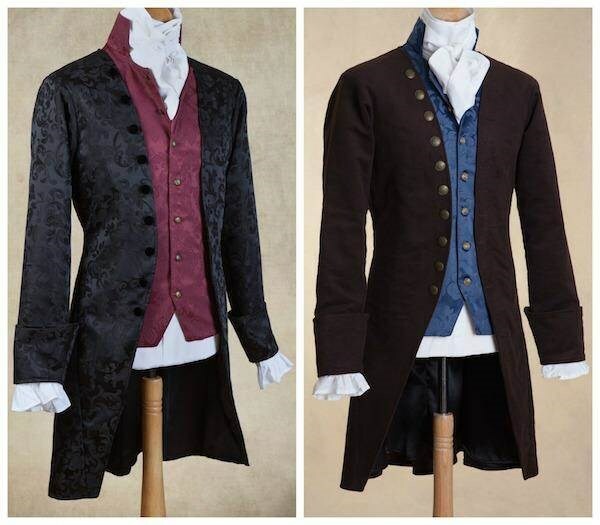 This is a classic 18th century style frockcoat that we offer in a range of different fabrics. Many customers will also buy the coordinating waistcoat and shirt to complete the look. The Bexley Coat, available in a range of fabrics. 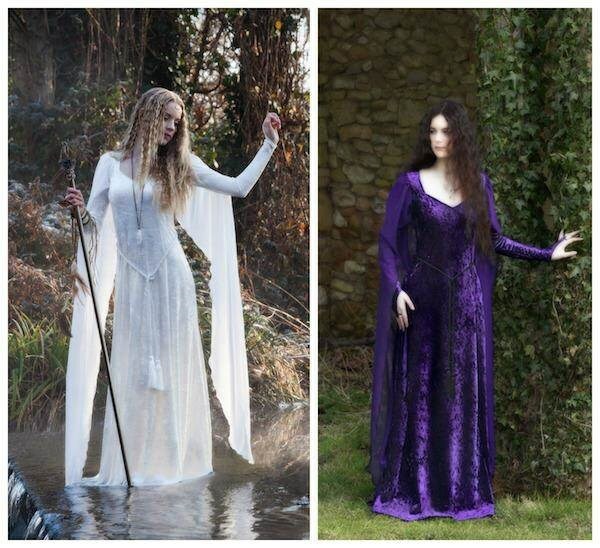 For ladies, the Avalon Dress and Faery Dress are always very popular. These two gowns work perfectly for Elven and Woodland themed weddings. 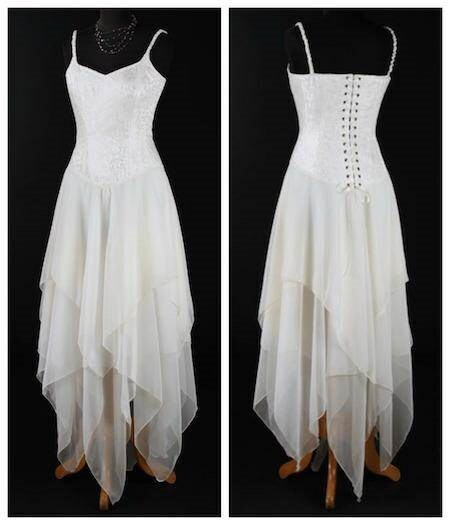 Avalon Dress, also available in Ivory. Faery Dress with corset style bodice. The Ravenswing Dress is also very popular; we tend to sell a lot of these in purple and green for Handfastings. The Ravenswing Dress, available in a range of colours. 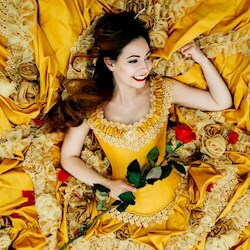 Do you have your own favourite designs? As well as being the designer for The Dark Angel, I am also a fine art photographer. Some of the designs featured on the website were created specifically for photographic projects that I have worked on. 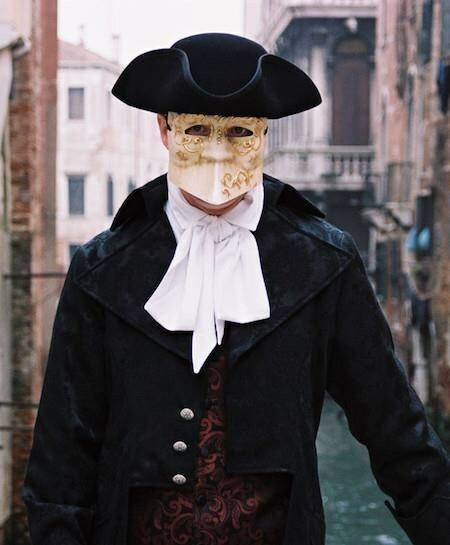 The process of creating a garment for general manufacture and creating costumes for an art piece is quite different. Garments that were created for images tend to be more elaborate, as their purpose is to tell a story rather than simply being a nice dress. Some of the photographs have been so popular that the garments featured in them have found their way into our collection! 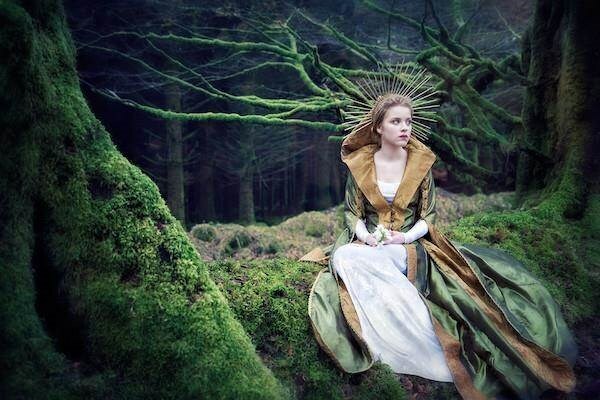 The ‘Mariposa Gown’ and the ‘Changeling Corset’ were both initially created for a fairytale shoot but are now very popular as wedding outfits. I think these designs will always be amongst my favorites because I love the idea of the fantasy that we created in those pictures becomes real for people when we recreate those designs specifically for them. We understand you had some trouble with floods a few months ago, was there much damage? Yes, it was devastating. The water was five foot deep in the studio, so we lost pretty much everything below head height. This velvet dress is available from a special SALE shop, set up to help get back on track after the floods. So are you open for business and taking on new orders? We are, but obviously it will be some time before we are working at full steam again as we have to replace fabrics stocks and redraft the pattern blocks before we can start work on the actual production of a garment. We are still able to offer most of the designs that are featured on the website, we just can’t take on as many orders as we would have done previously. Head over to The Dark Angel website to find out more. You have some stunning designs suitable for Gothic, Medieval and Pagan brides and grooms, would you say the majority of your orders are for weddings? Definitely. We also do a lot of work for fantasy balls, proms, theatre, photography etc. but weddings and handfastings are our main production. Beautiful steel boned Baroque Corset. 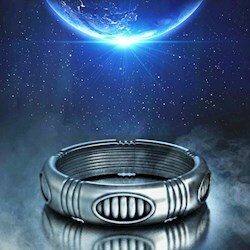 How far in advance should people place their orders? It really depends on the garment; a lot of basic items are held in stock and can be dispatched immediately. Items that need to be manufactured can take anything from 4 to 8 weeks. 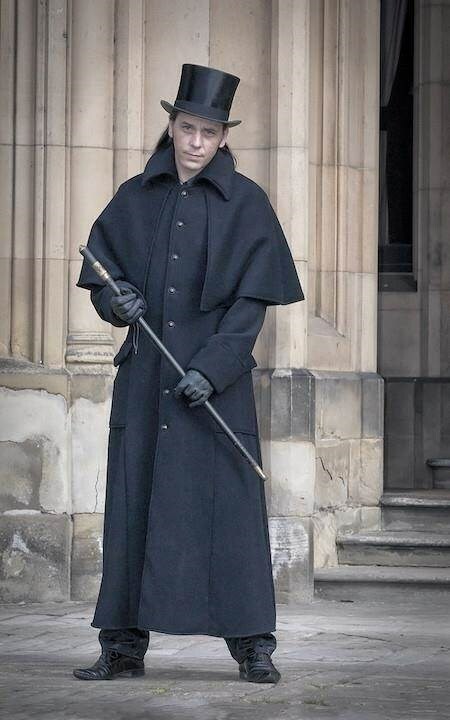 Made to order Kensington Coat, based on a traditional Victorian Coachman's overcoat. Without giving away your secrets, would you be able to tell us a bit about your work process? Everything that we produce is manufactured individually in our own UK studio, we don’t farm anything out or buy anything in. It is unusual these days for garments to be made from start to finish by the same seamstress. Of course this is more expensive than mass produced factory made clothing but it does ensure a much higher quality item and it means that we are able to customise garments to the customer's specific requirement. Our production methods are also far more ethical and have less impact on the environment than mass-produced clothing. Ethical production is an issue that has always been vitally important to us. What makes The Dark Angel stand out from the crowd? As well as offering a unique and customisable design range, we believe that we also offer an exceptional level of customer service. We will work very closely with a customer to ensure that everything is as perfect for them as it possibly can be. Every order, no matter how big or small, is processed individually. I know it sounds cheesy but we genuinely do care about our customers and want them to be happy with the products and service that they receive. Velvet, satin and sace Damselle Dress. What can customers expect from you and your work? Our customers can expect a high level of attention to detail, both in the service that we offer and the clothing that we produce. They can be assured that they will receive a high quality, professionally crafted garment that will last for many years. The dramatic Bow Cravat Shirt, also available in black. Do you have any tips or advice for brides/couples planning an alternative wedding? It is your day, do it your way! I have seen so many couples compromise their ideas because they are trying to please everybody. You can’t please everyone, so there is really no point compromising, just go for it and have the day that you really want. 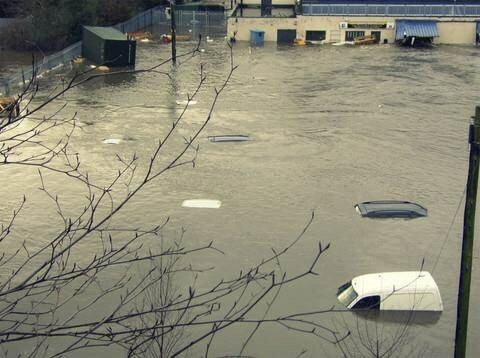 This shot of the carpark gives you an idea of the scale of the floods. More photos and info here. Thanks to Carri from The Dark Angel for speaking to us. We hope you manage to get things back to normal soon! A crowdfunding page has been set up for anyone wishing to help The Dark Angel get through these testing times. 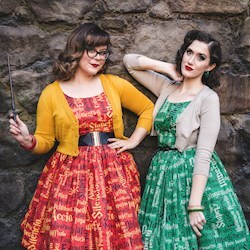 Or, of course, you can go buy yourself some amazing new clothes from either the Dark Angel Website or their Etsy Shop! Also please check out Lunaesque, who are responsible for a lot of the wonderful photos above.